What happened? Ash is suddenly warped though time to a medieval setting. The year is 1300 A.D..
At least he has his boomstick. The Sam Raimi horror trilogy started as just that, horror, and it was pretty darn great. The Evil Dead. Next was an outstanding satirical blend of the horrors of horror with the hearty laughs of comedy. So damn good. Evil Dead II. Now Ash must take on an army. Army of Darkness. What an imaginative and friggin' fun way to close out a pretty terrific set of films. Bruce Campbell elevated his game to new, charismatic levels with his absurdly on point performance in Evil Dead II and his ability to steal not only scenes but every damn frame he is in continues here, with his comedic timing and delivery of dialogue reaching new heights. He was limited to essentially a single set piece during both of the previous films, which made it all the more impressive when he was able to bring such life and energy to the pictures. 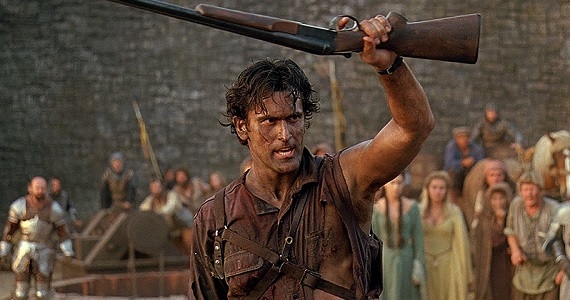 Army of Darkness gives him a whole lot of room to showcase his talent and he takes advantage of the opportunity, even if it is over the course of only a slim 80 minutes. I have been asked by multiple people recently which of the trilogy is my favorite, and after revisiting it is a really tough decision. I find the original to be a great film yet it would probably be at the bottom, basically because it didn't allow Campbell to show his amazing potential to entertain, but even so I probably wouldn't change a thing about that movie because I think the contrasting tones of all three are a blessing to the whole experience rather than a curse. 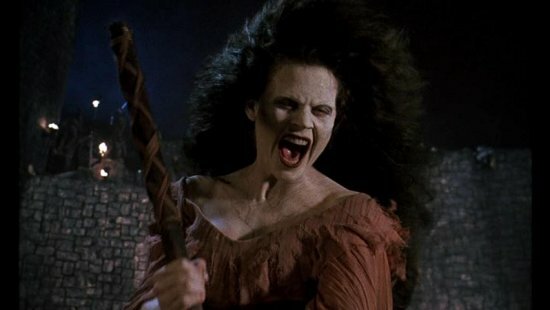 Army of Darkness is such a blast and a deliciously fast paced treat to enjoy on a night with a craving for comedy but not a lot of time to kill, but I feel comfortable stating that Evil Dead II is the crowning achievement of the three. Such a frenetic, fantastic piece of cinema, especially considering how limited the experience seems like it should be yet somehow isn't. Every single time Evil Dead II felt like it should go downhill, it somehow managed to keep going up. Regardless, you can't go wrong with any of these Raimi - Campbell collaborations. 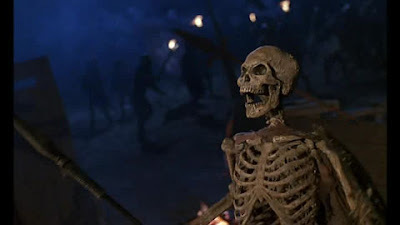 If you like your cinematic dish a little lighter on the gore and the horror and heavier on the laughs, Army of Darkness is just what you are looking for. Such a great film, so quotable! No doubt about it Cody, it is the most quotable of the bunch. Hard to not smile early and often watching Army of Darkness.